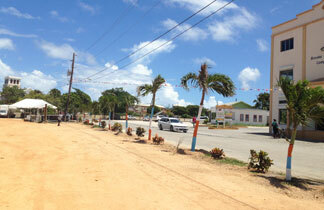 I had almost given up on catching up with Sly at his Anguilla food van during daylight hours. I had met Sly in the grocery store a couple years back - a nice guy and I had heard word of his good food. 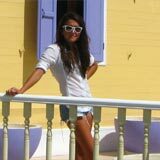 There was Sly's vibrant food van set against the backdrop of Caribbean blue sky, framed by petite palm trees painted in Anguilla's colors and the Slyco order window was open! I did a U-turn and parked on the freshly laid turf that surrounds his location across from the Brooks & Sons Complex and just down the street from Ken's BBQ tents. As I walked up Sly greeted me with a smile and then another fresh face quickly appeared at the window with an even bigger smile… his son, Tishawn. I had caught Sly just before lunch time. The added bonus was Tishawn, as he helps out when he's not in school. 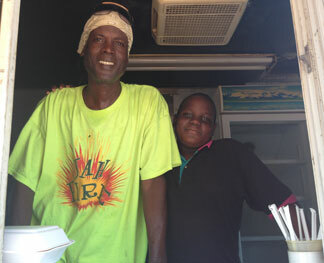 Since school in Anguilla starts back in late August, Tishawn helps his dad in the food van over his summer break. 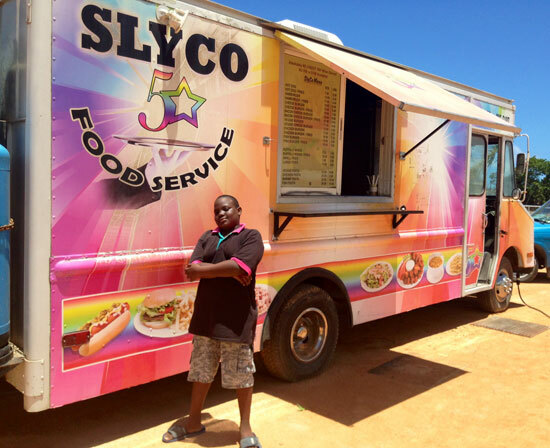 Tishawn proudly told me many of the details about Slyco's Food Van. He spoke about the menu and what the best-sellers were - the bacon cheeseburger with fries, the chicken pasta and the fishburger with fries with his personal favorite being the shrimp pasta. 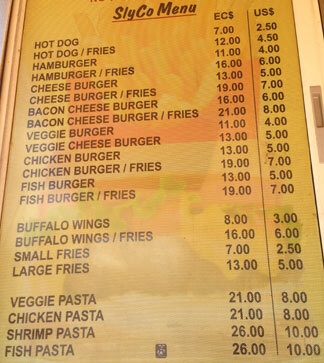 The food options are clearly posted with prices right next to the order window and the menu is straight-forward. However, Tishawn told me that customers can customize their orders. For example, you may not want lettuce and tomato on your fish burger but wish to add cheese. No problem! He told me about the drinks they sell too. 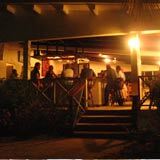 They serve a cold variety of juices and sodas including your common soft drink brands and Arizona's and Vita Malt's and of course, water. Sly himself told me of how his food van came to be. 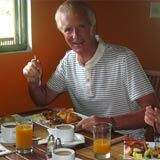 He started his food service in 2009. Prior to that he had been working as a chef at some of Anguilla's top hotels and resorts such as Cap Juluca and Malliouhana. 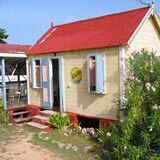 He also had been a chef at some of Anguilla's private villas. After his stint of being a chef for Anguilla hotels and villas, Sly considered taking a break from the heat of the oven in someone else's kitchen and being his own boss over what he knows how to do... cook! He also knew he'd have more flexibility to be available for his son. 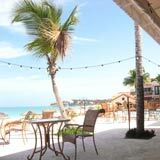 Anguilla is known not only for its beaches and sweet people, but for its food. 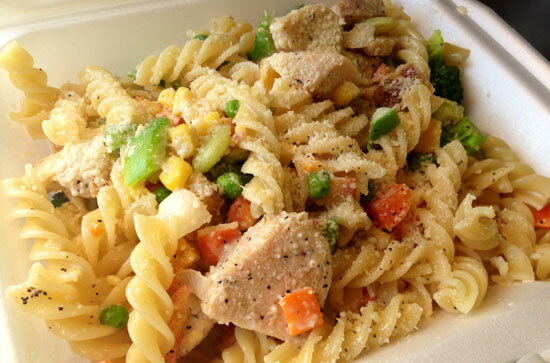 As there are no fast food chains or restaurants in Anguilla, food vans tend to be the closest comparable convenience to such places. Another nice point is that you get a nice quick chat with the food van workers while you wait for your freshly made food. 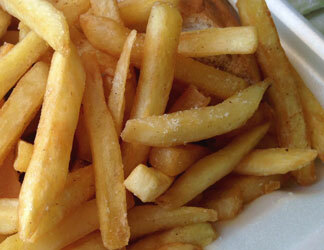 Sly and his food van, Slyco are in place every evening of the week from 6:30pm until 11pm. For lunch, he's there from around noon to 1pm, Monday through Saturday. Stop by, say hi, place your order and see if you don't agree that Sly is nice and his food is tasty, economical and convenient! Directions: Slyco is located down the street from Ken's Pork in the Valley, opposite People's Market. Affordable food van with tasty burgers and meals. Hours: Daily for lunch and dinner. Closed Sunday.